Despite my affinity for vegan and vegetarian meals, I’ve never been a huge fan of tofu. There are, however, a few tofu dishes that I really love and this one holds the #1 spot. Heidi at 101 Cookbooks has such amazing vegetarian, whole food dishes, and everything I’ve tried from her website I’ve loved. Not surprisingly, my second favorite tofu dish is also from her blog, the Garam Masala Tofu Scramble (I prefer to make mine with leeks in place of the fennel). This one is a wonderful balance of savory and sweet, with the tofu crispy on the outside and the sweet pecans adding nutty crunch. The slightly bitter edge of the brussels sprouts is offset by the brown sugar and garlic and the different flavors come together in complete harmony. I’m submitting this recipe it to the lovely Sophia of Burp and Slurp for the BSI (Blogger Secret Ingredient) challenge (she chose brussels sprouts). Check the link if you’re interested in joining in the brussels sprouts fun! 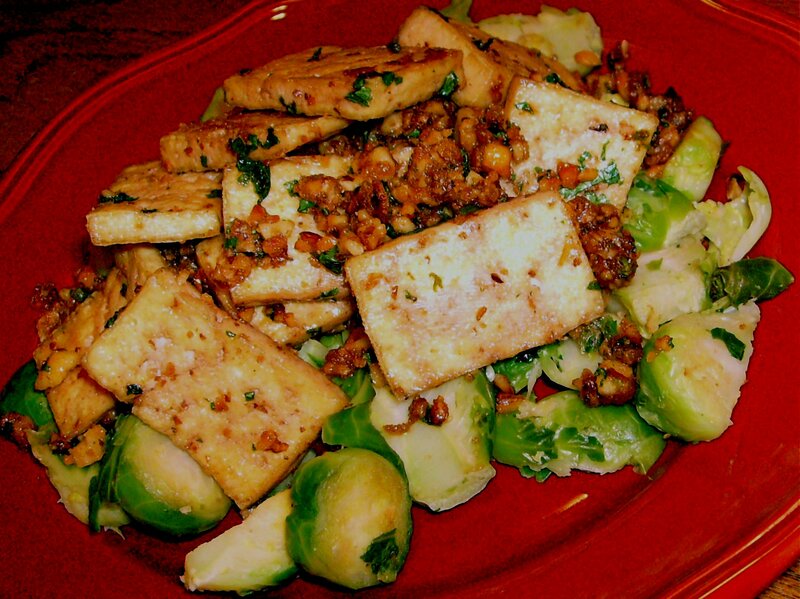 Posted in Lighter Fare, Main Dishes, Vegetarian & Vegan and tagged brussels sprouts, caramelized tofu. Bookmark the permalink. Oooh, I love the pecans in this dish! They’re the perfect pairing with brussels sprouts and it looks like they also go fantastically with that caramelized tofu (which by the way looks incredible! ;) ). You mean you could look directly at the pic without going blind? ;) It really hurts my eyes to look at it–I need to replace it ASAP! And yes, the pecans are perfect here. I love everything about this dish. This makes tofu look like it might be edible. I will have to surprise my husband some night for dinner. He would never willingly purchase tofu. It looks great! LOL–my Mom tried to force tofu down our throats growing up but I never liked it. But I promise you, this recipe is wonderful! Oh, Thank You! I have some tofu i had purchased the other day and had no idea what to do with it! I am on a mission for lighter cooking and decided to experiment. Thanks for this post, I will make this as soon as i get back from my camping trip!